The C# compiler is lazy, which is usually a very good thing, but that can also give you some issues. We recently tracked down a memory usage issue to code that looked roughly like this. On the surface, this looks good. We are only using largeData for a short while, right? You need to pay special attention to what is going on. We need to maintain the local state of the variables. So the compiler lift the local parameters into an object. (Called __DisplayClass3). Creating spurious objects is something that we want to avoid, so the C# compiler says: “Oh, I’ve two lambdas in this call that need to get access to the local variables. Instead of creating two objects, I can create just a single one, and share it among both calls, thereby saving some space”. Unfortunately for us, there is a slight issue here. The lifetime of the stats object is pretty long (we use it to report stats). But we also hold a reference to the completion delegate (we use that to report on stuff later on). Because the completion delegate holds the same lifted parameters object, and because that holds the large data object. It means that we ended up holding a lot of stuff in memory far beyond the time they were useful. The annoying thing is that it was pretty hard to figure out, because we were looking at the source code, and the lambda that we know is likely to be long running doesn’t look like it is going to hold a referece to the largeData object. Imagine that you go to the bank, and ask for a 100,000$ mortgage. The nice guy in the bank agrees to lend you the money, and since you need to pay that in 5 installments, you take 15,000$ to the contractor, and leave the rest in the bank until it is needed. The bank is doing brisk business, and promise a lot of customers that they can get their mortgage in the bank. Since most of the mortgages are also taken in installments, the bank never actually have enough money to hand over to all lenders. But it make do. Until one dark day when you come to the bank and ask for the rest of the money, because it is time to install the kitchen cabinets, and you need to pay for that. The nice man in the bank tell you to wait a bit, and goes to see if they have any money. At this point, it would be embarrassing to tell you that they don’t have any money to give you, because they over committed themselves. The nice man from the bank murders you and bury your body in the desert, to avoid you complaining that you didn’t get the money that you were promised. Actually, the nice man might go ahead and kill someone else (robbing them in the process), and then give you their money. You go home happy to your blood stained kitchen cabinets. That is how memory management works in Linux. After this dramatic opening, let us get down to what is really going on. Linux has a major problem. Its process model means that it is stuck up a tree and the only way down is via free fall. Whenever a process wants to create another process, the standard method in Linux is to call fork() and then call execv() to execute the new binary. The problem here is what fork() does. It needs to copy the entire process state to the new process. That include all memory, handles, registers, etc. Let us assume that we have a process that allocated 1GB of memory for reading and writing, and then called fork(). The way things are setup, it is pretty cheap to create the new process, all we need to do is duplicate the kernel data structures and we are done. However, what happens when the memory that the process allocated? The fork() call requires that both processes will have access to that memory, and also that both of them may modify it. That means that we have a copy on write situation. Whenever one of the processes modify the memory, it is forcing the OS to copy that piece of memory to another physical memory location and remap the virtual addresses. This allows the developer to do some really cool stuff. Redis implemented its backup strategy via the fork() call. By forking and then dumping the in memory process state to disk it can get consistent snapshot of the system with almost no code. It is the OS that is responsible for maintaining that invariant. Speaking of invariants, it also means that there is absolutely no way that Linux can manage memory properly. If we have 2 GB of RAM on the machine, and we have a 1GB process that fork()-ed, what is going to happen? Well, it was promised 1 GB of RAM, and it got that. And it was also promised by fork() that both processes will be able to modify the full 1GB of RAM. If we also have some other processes taking memory (and assuming no swap for the moment), that pretty much means that someone is going to end up holding the dirty end of the stick. Now, Linux has a configuration option that would prevent it (vm.overcommit_memory = 2, and the over commit ratio, but that isn’t really important. I’m including this here for the nitpickers, and yes, I’m aware that you can set oom_adj = –17 to protect myself from this issue, not the point.). This tell Linux that it shouldn’t over commit. In such cases, it would mean that the fork() method call would fail, and you’ll be left with an effectively a crippled system. So, we have the potential for a broken invariant. What is going to happen now? Well, Linux promised you memory, and after exhausting all of the physical memory, it will start paging to swap file. But that can be exhausted to. That is when the Out Of Memory Killer gets to play, and it takes an axe and start choosing a likely candidate to be mercilessly murdered. The “nice” thing about this is that there is no control over that, and you might be a perfectly well behaved process that the OOM just doesn’t like this Monday, so buh-bye! Looking around, it seems that we aren’t the only one that had run head first into this issue. The Oracle recommendation is to set things up to panic and reboot the entire machine when this happens, and that seems… unproductive. The problem is that as a database, we aren’t really in control of how much we allocate, and we rely on the system to tell us when we do too much. Linux has no facility to do things like warn applications that memory is low, or even letting us know that by refusing to allocate more memory. Both are things that we already support, and would be very helpful. We have an amateur photographer in the office, who like to arrange the rhinos in the office (now exceeding 100, I think) in various ways. We are porting RavenDB to Linux, and as such, we run into a lot of… interesting issues. Today we run into a really annoying one. We make use of the BufferManager class inside RavenDB to reduce memory allocations. On the .Net side of things, everything works just fine, and we never really had any issues with it. On the Mono side of things, we started getting all sort of weird errors. From ArgumentOutOfRangeException to NullReferenceException to just plain weird stuff. That was the time to dig in and look into what is going on. On the .NET side of things, BufferManager implementation is based on a selection criteria between large (more than 85Kb) and small buffers. For large buffers, there is a single large pool that is shared among all the users of the pool. For small buffers, the BufferManager uses a pool per active thread as well as a global pool, etc. In fact, looking at the code we see that it is really nice, and a lot of effort has been made to harden it and make it work nicely for many scenarios. The Mono implementation, on the other hand, decides to blithely discard the API contract by ignoring the maximum buffer pool size. It seems because “no user code is designed to cope with this”. Considering the fact that RavenDB is certainly dealing with that, I’m somewhat insulted, but it seems par the course for Linux, where “memory is infinite until we kill you”* is the way to go. But what is far worse is that this class is absolutely not thread safe. That was a lot of fun to discover. Considering that this piece of code is pretty central for the entire WCF stack, I’m not really sure how that worked. We ended up writing our own BufferManager impl for Mono, to avoid those issues. * Yes, somewhat bitter here, I’ll admit. The next post will discuss this in detail. We are working on performance a lot lately, but performance isn’t just an issue of how fast you can do something, it is also an issue of how many resources we use while doing that. One of the things we noticed was that we are using more memory than we would like to, and even after we were freeing the memory we were using. Digging into the memory usage, we found that the problem was that we were suffering from fragmentation inside the managed heap. More to the point, this isn’t a large object heap fragmentation, but actually fragmentation in the standard heap. The underlying reason is that we are issuing a lot of outstanding async I/O requests, especially to serve things like the Changes() API, wait for incoming HTTP requests, etc. Here is what this looks like inside dotProfiler. 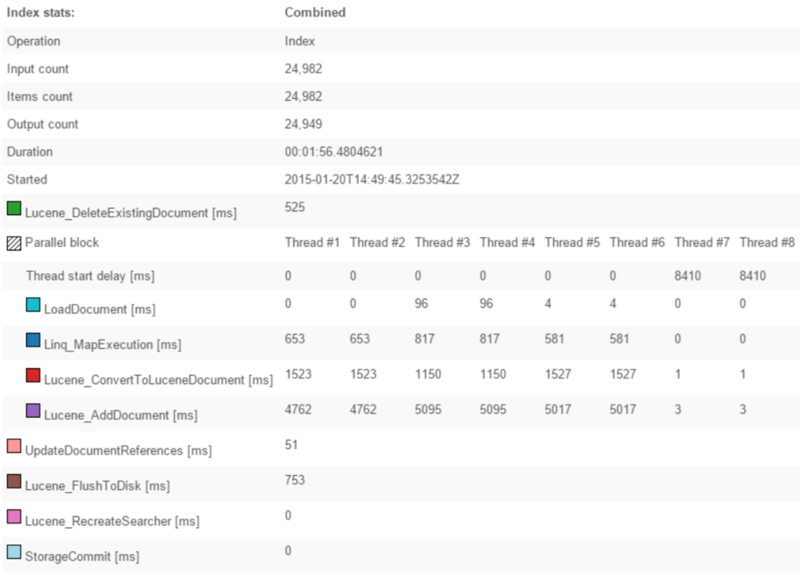 As you can see, we are actually using almost no memory, but heap fragmentation is killing us in terms of memory usage. We suspect that the issue is that we have pinned instances that we sent to async I/O, and that match what we have found elsewhere about this issue, but we aren’t really sure how to deal with it. Maxim has posted about some improvement to spatial API in RavenDB. * Can’t care enough to figure out if this is the same as the previous one or not. In each of those cases, they offered similar, but not identical API and options. That is completely ignoring the versioning side of things ,where we have .NET 2.0 (1.0 finally died a while ago), .NET 3.5, .NET 4.0 and .NET 4.5. I don’t think that something can be done about versioning, but the packaging issue is painful. In each case, we need to subtly tweak the system to accommodate the new packaging option. This is pure additional cost to the system, with zero net benefit. Each time that we have to do that, we add a whole new dimension to the testing and support matrix, leaving aside the fact that the complexity of the solution is increasing. I wouldn’t mind it so much, if it weren’t for the fact that a lot of those are effectively drive-bys, it feels. Silverlight took a lot of effort, and it is dead. WinRT took a lot of effort, and it is effectively dead. This adds a real cost in time and effort, and it is hurting the platform as a whole. Now users are running into issues with the Core CLR not supporting stuff that we use. So we need to rip out MEF from some of our code, and implement it ourselves just to get things in the same place as before. Note, this post was written by Federico. I want first to give special thanks to Thomas, Tobi, Alex and all the others that have made so many interesting comments and coded alternative approaches. It is a great thing to have so many people looking over your work and pointing out interesting facts that in the heat of the battle with the code we could easily overlook. It was just three weeks since I wrote this series of posts, and suddenly three weeks seems to be a lot of time. There had been very interesting discussions regarding SSE, optimization, different approaches to optimize specific issues, about lowering measurement errors, that I was intending to write down in a follow up post. However, there was an earth shattering event happening this week that just made that post I wanted to write a moot exercise. Let’s first recap how we ended up optimizing compares. At first we are using memcmp via P/Invoke. Everything was great for a while, until we eventually hit the wall and we needed all the extra juice we could get. Back at the mid of 2014 we performed the first optimization rounds where for the first time introduced a fully managed pointers based solution. That solution served us well, until we started to optimize other paths and really stress RavenDB 3.0. In the second round, that eventually spawned this series, we introduced branch-tables, bandwidth optimizations, and we had to resort to every trick on the book to convince the JIT to write pretty specific assembler code. And here we are. 3 days ago, on the 3rd of February, Microsoft released CoreCLR for everyone to dig into. For everyone interested in performance it is a one in a million opportunity. Being able to see how the JIT works, how high-performance battle tested code is written (not looking at it in assembler) is quite an experience. // The attributes on this method are chosen for best JIT performance. // Please do not edit unless intentional. Needless to say that caught our attention. So we did what we usually do, just go and try it . The initial results were “interesting” to say the least. Instantaneously we could achieve faster speed-ups for our copy routines (more on that in a future series --- now I feel lucky I didn’t wrote more than the introduction). In fact, the results were “so good” that we decided to give it a try for compare, if we could at least use the SSE optimized native routine for big memory compares we would be in a great spot. The result of our new tests? Well, we were in for a big surprise. We just needed to be a bit more permissive, aka disable P/Invoke security checks. This attribute can be applied to methods that want to call into native code without incurring the performance loss of a run-time security check when doing so. The stack walk performed when calling unmanaged code is omitted at run time, resulting in substantial performance savings. Well I must say substantial is an understatement. We are already running in full-trust and also memcmp is safe function by default, then no harm is done. The same cannot be said by memcpy, where we have to be extra careful. But that is another story. The gains are undeniable, especially where it matters the most for us (16 - 64 bytes). As you can see the managed optimizations are really good, at the 2048 level and up we are able to compete with the native version (accounting for the P/Invoke that is). * We could try to write our own optimized routine in C++/Assembler (if that is even possible), but that is something it is out of scope at the moment (we have bigger fishes to fry performance-wise). I especially like how it shows the actual costs, including using parallel computing. I’m running the numbers, and I didn’t really believe them. So I put them in a chart, and I’m still not sure that I trust them. Here you can see our income per month for the past year. Yes, July was pretty bad with everyone on vacation and no one is buying. March 14 was pretty good, with people buying RavenConf tickets are a lot of excitement around that. September and October were great. In fact, October was out best month ever. And then we get to February 2015. In other words, this month. In other words, this month where we still have 10 more days to make sales. I’m pretty happy . But I wished that I had hard numbers on why.